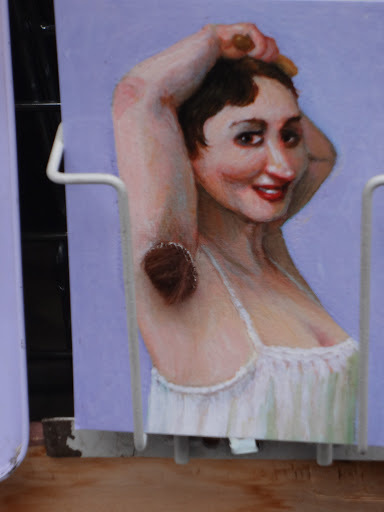 I left Berlin with fond memories, it was everything that I hoped for. The Obenaus made it all the more special. I left Berlin in the afternoon and took the train to Plochingen which is on the outskirts of Stuggart. 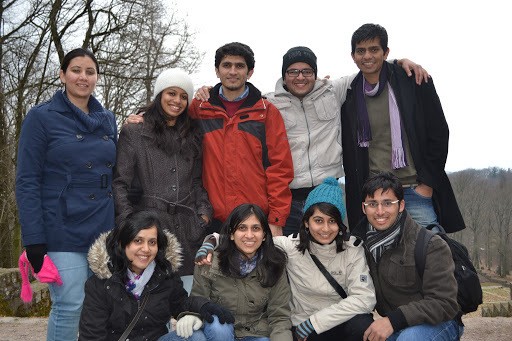 Plochingen is where I reunited with not just Sailee- Chinmay but also some more friends. I met Shriyash his wife Amrapali, whom I did know from before, they were the ones to host us in their classy house, courtesy Bosch. 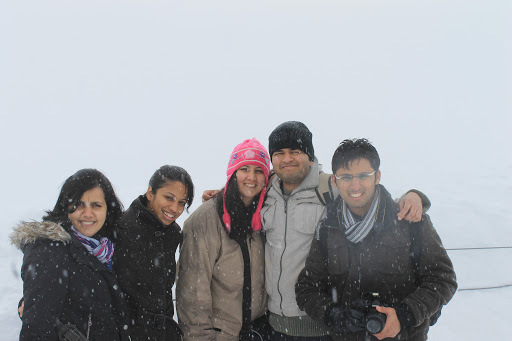 We were also joined by Aniket his wife Smita and Umesh, Shriyash’s friend. 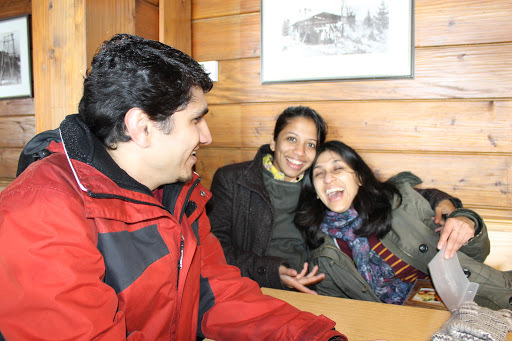 I was meeting Aniket, Smita and Umesh for the first time but it didnt exactly feel like it. We as a group hit it off really well and that ensured that it was going to be an absolute joyride. I reached Shriyash’s house at 10 in the night. I was immediately served with , chicken curry and rice. I was pretty hungry and relished the feast. We all sat together and ate. 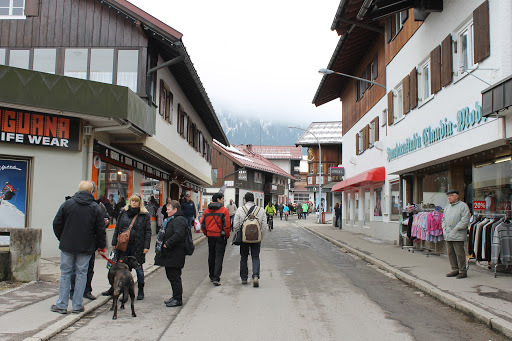 The next day we left pretty early in the morning to Oberstdorf Allgaeu which is a village in the Alps. 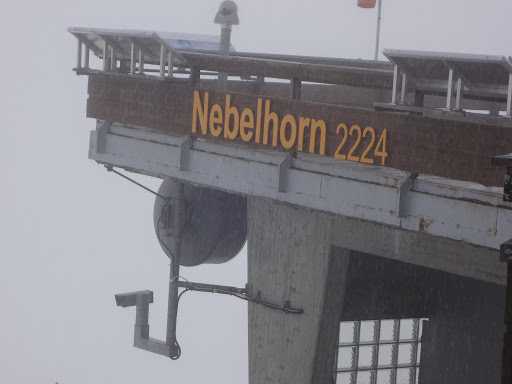 We were basically going to Nabelhorn which is a peak at a height of 2224m. We had to take three cable cars(Bergbahn) at different heights. 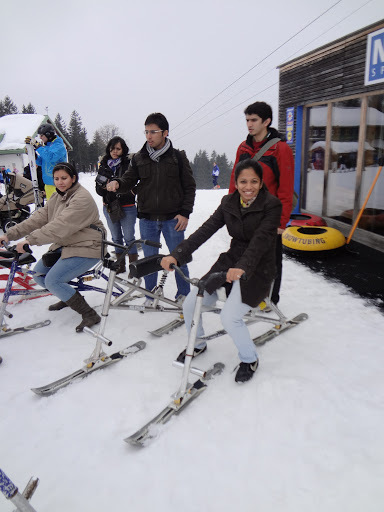 At our first stop we did something which wasnt a part of the plan, SNOW SPORTS. They had everything from a cycle, tyres, sledges and what not. I did everything. It was scary at first just the thought of it, but than that was the point. 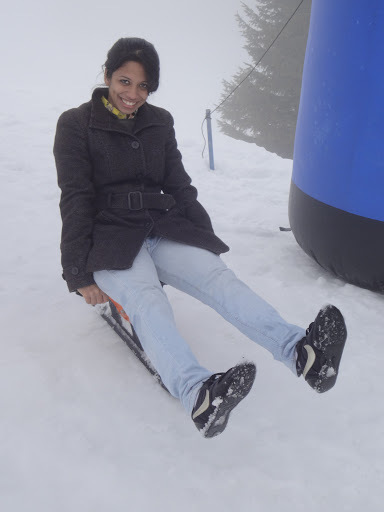 The sheer thrill was something I felt after a long time. It was unbelievable amount of fun. After that we skipped the second stop and straight away went to the peak. 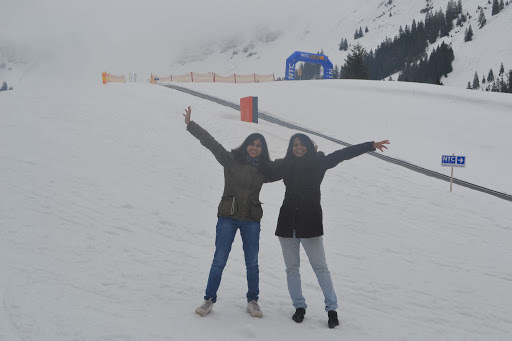 We clicked pictures, tried a hand at making a snowman, and failed miserably and ofcourse snow fights. 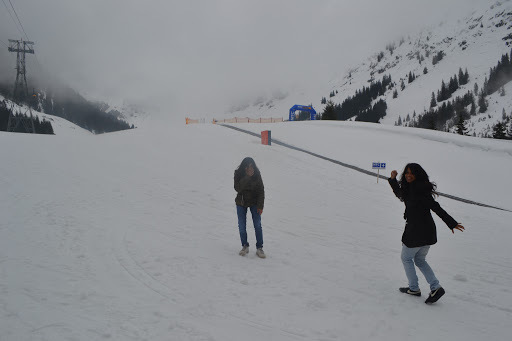 (Ice can hit you really hard I realised) We couldnt see anything it was all foggy,all white and pin drop silence. If there is a heaven it could look like this. We were really cold and it was time to have a coffee and guess what they actually had a small restaurant at the peak. We went in and I got myself a Hot Chocolate. Gosh! I was in the Alps seeping a delicious hot chocolate, is that real? AT THE TOP OF THE WORLD RESTAURANT..
Nabelhorn is the GERMAN side of the peak, on a sunny day one could actually see the Austrian and Switzerland borders as well. We couldnt see it this time around as visibility was almost zero. It was an experience that will stay with me forever . The sheer beauty of the place was spellbounding. Nature is such a great teacher. When you see things from such a height you realise how really small you are in the scheme of things. All you can really do is silently bow down to it! Thats really the only thing you are capable of. We came back home pretty tired. We had some Khichdi and dahi and went to sleep. 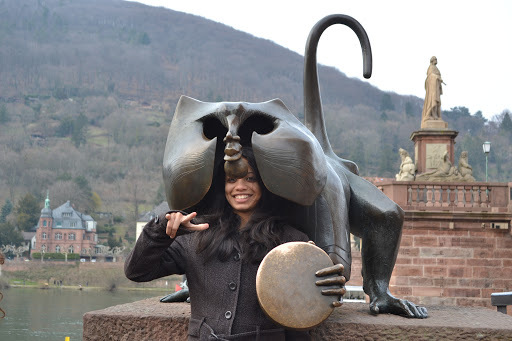 The next day was Heidelberg. Its one of the most beautiful and authentic Eurpean cities, and its so, so romantic. 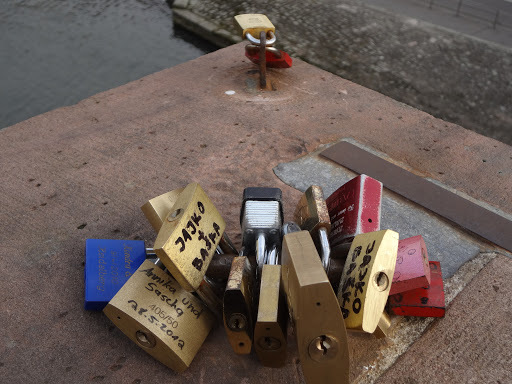 Its situated on the river Necker in the steep valley in Odenwald. 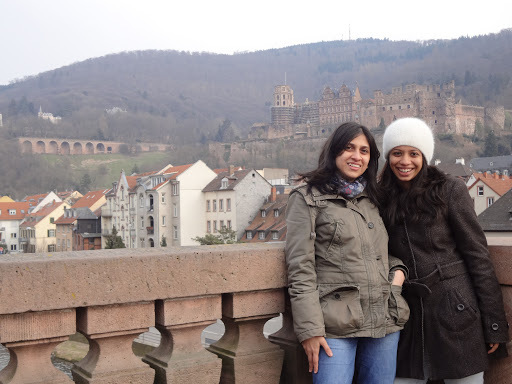 We went driving from Plochingen to Heidelberg, the drive was for two hours and picturesque. 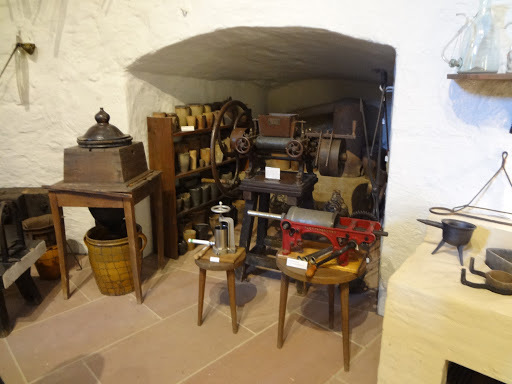 The Heilderberg Castle is again a major tourist spot and rightly so. In its ruins is so much beauty. Its situated quite up in the region so you actually get a veiw of the whole city and the river flowing through it. 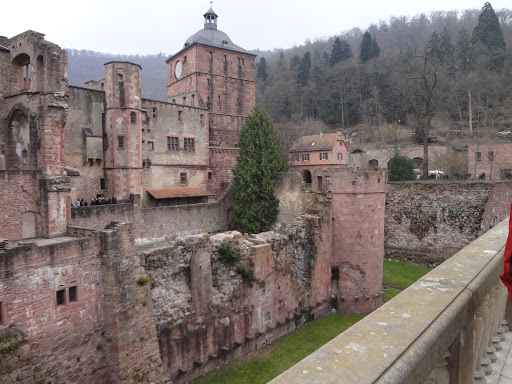 The castle was first built by Conrad of Houhenstaufen. It was demolished and built again numerous times by many kings. 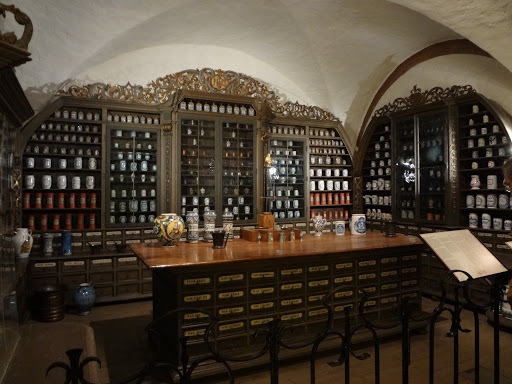 The castle had an Apotheke(medicines) Museum. 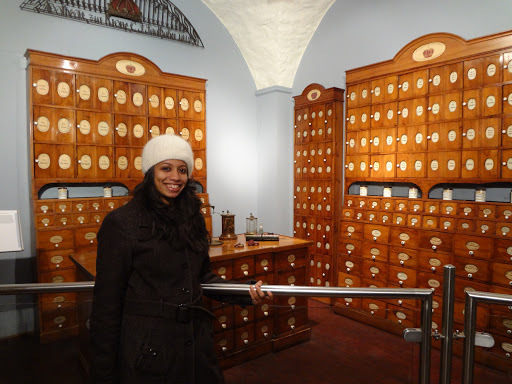 It had all the history of their medicine and ways of treatment and how it developed. 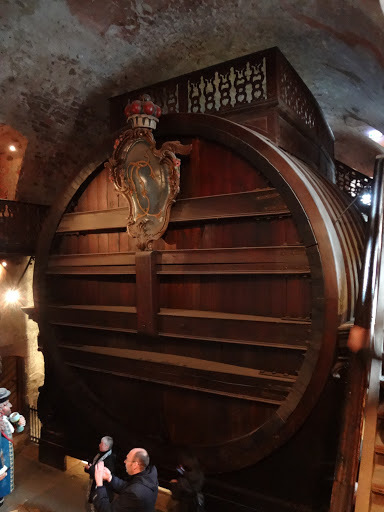 It also had this winery with huge barrels that were used to store wine. The size of it, you have to see it to believe it. It was wonderful. If I had a bollywood hero I wouldnt have mind shooting a romantic number here. I am sure a lot of songs might have been shot here already. 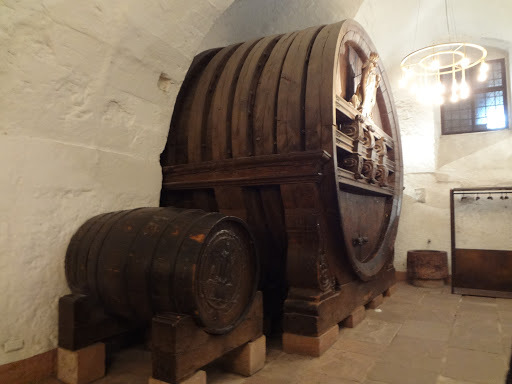 WINE BARRELS…ARE THE HUGE OR WHAT?? 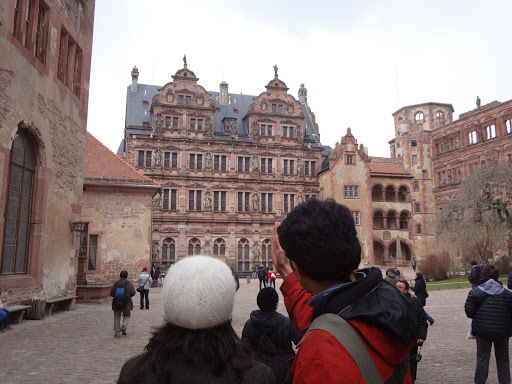 At the castle we were joined by Swarali who is currently studying in Heidelberg. She is Chinmay’s school mate. It was great to have her she took us for lunch at a familiar Chinese restaurant. 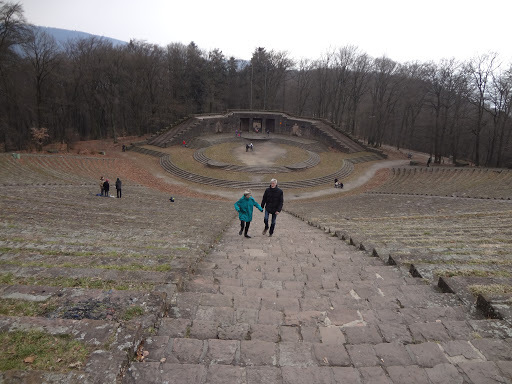 From there she took us to a Monastery and an Amphitheatre which was used by Hitler to have his secret meetings back then. It was situated at an even higher altitude than the castle. The amphitheatre was so huge that a football match could be hosted there. 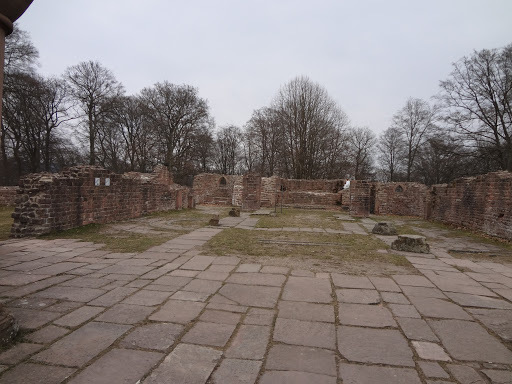 The monastery was again in ruins but serene. 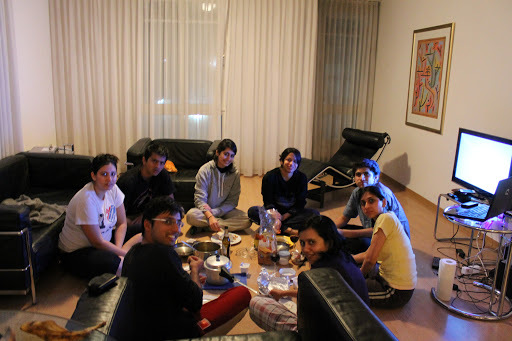 We clicked some great shots and headed to Swarali’s beautiful house for some tea. Before that, we took some time to get on the Old Bridge on the Necker river and walk on it. I also had a nutella and nuts crepe which I was dying to eat. After this we got to Swarali’s place freshened up and headed home. 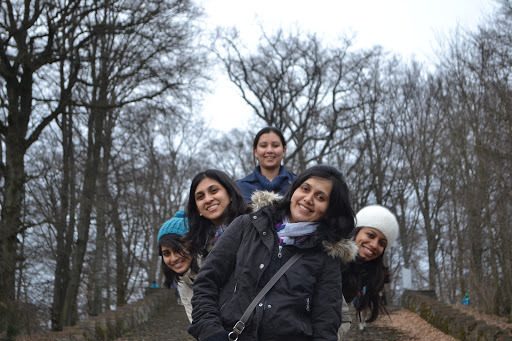 We convinced Swarali also to join us and she did. We came back home and had rasa,poli and rice for dinner. After which we started with the great Dumsharats battle, which lasted till almost 2 in the night. I laughed so much throughout the game that I had a severe stomach ache. Umesh was the funniest in his acting skills. I and Aniket were almost waiting for his chance to act all the time. He was a total sport about it, but I was on the floor laughing most of the times. The next day we part ways to get back home, as the Easter holidays for all of them had ended. It was time to get back to work. I had an awesome time in the last two days. The places I saw, the awesome company, the new friendships everything is some thing I will cherish forever. 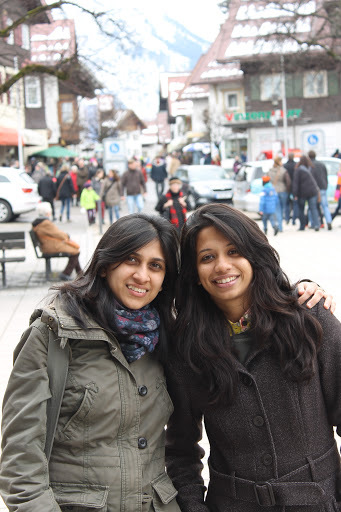 On the way back in the White Bullet, Sailee and Chinmay gave me another experience of my life. They took me to the train restaurant for a coffee and cake. God! It was amazing. 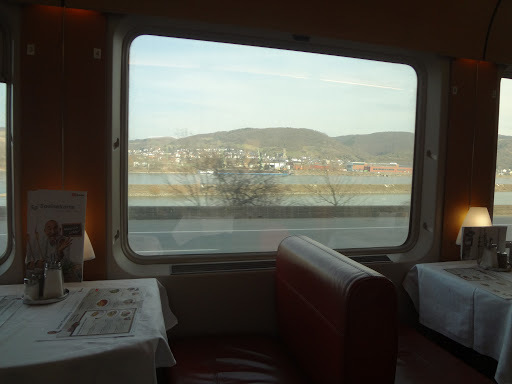 Rhine river and snow clad mountains on one side and me sipping my coffee sitting in a restaurant which is actually in a train. Life seemed perfect, if only Ranbir would have walked out from one of the doors and joined us, I was ready to die peacefully right there! 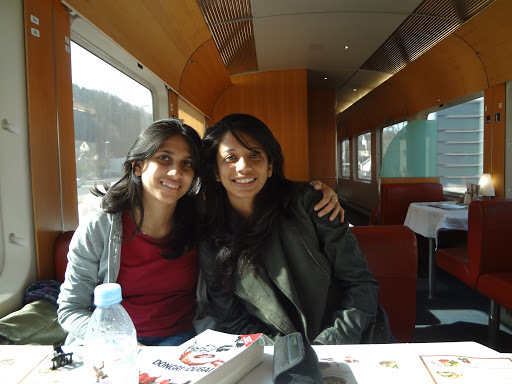 COFFEE IN THE TRAIN RESTAURANT..